From the kitchen of One Perfect Bite...When I was a little girl, bread not made at home came from a neighborhood bakery. These were, of course family operations, and tradition dictated that children be given a free cookie when they came into the store. Though grateful, I was always disappointed because I had my eyes on bigger things. I desperately wanted one of the giant sugar cookies displayed in the shop window. While they never made it to our market basket, there were times when two or three carefully wrapped eggs or a hunk of butter did. During the war years, bakeries were exempt from the rationing imposed on the general population and bakers, interestingly, were also exempt from the draft. No one talked much about it, but our early birthday cakes were almost always the results of negotiations with the baker, who did very nicely for himself during the war years. I'm convinced my love of giant and monster cookies dates back to that period of my life. I love to buy them, I love to bake them, and I certainly love to eat them. It's true I've gotten fussy over time. Most of the commercial variety taste like frosted cardboard, so I've taken to making my own. This is one of the recipes I've collected for them, and because this week is dedicated to all things lemon, I thought you might enjoy my giant lemon sugar cookies. They're not half bad, and if you like lemon, you'll probably love them. You'll find the flavor and ease with which they can be made, improves the longer the dough is chilled. I prepare the dough a day before I plan to shape and bake the cookies. These are really easy to do and the raw cookie dough also freezes well. I hope you'll enjoy them. Here's the recipe. 1) To make lemon sugar: Combine 1/2 cup sugar with 1 teaspoon lemon zest in the bowl of a mini-food processor. Pulse until lemon zest is incorporated into sugar. Pour into a small bowl and stir to break up any clumps. Set aside. 2) To make cookie dough: Combine flour, salt, cream of tartar and baking soda in a medium bowl. Set aside. In a large mixing bowl, cream butter with reserved 1-1/2 cups sugar. Blend in eggs, one at a time. Add lemon extract, lemon juice and reserved lemon zest. Add flour mixture, one cup at a time, blending well after each addition, until all flour is incorporated. 3) To bake cookies: Preheat oven to 350 degrees F. Shape dough into balls using 2 tablespoons of dough for each cookie. Roll in reserved lemon sugar. Bake in batches of six cookies per 18 x 13-inch baking sheets. Place balls of sugar coated dough on cookie sheets. Press down with the bottom of a glass or measuring cup until cookie is about 1/2-inch thick. Bake cookies for 12-14 minutes. Remove tray from oven. Let cookie sit on tray for 5 minutes before transferring to cooling rack. Yield: 24 saucer-sized cookies. Whow, I love these giant lemon cookies, I bet they're incredibly tender and tangy. Have a nice day dear Mary! In Greece we still have bakeries in the neighborhoods and these are the places where we buy bread. Usually our childhood memories follow us for the rest of our lives. The cookies look giant and delicious Mary! That was a heartwarming childhood story. I love your big giant cookies. And the fact that they are lemon flavoured makes them that much more wonderful. YUM! And who wouldn't like a giant cookie?? ?When we are kids all the bigger things are better than the smaller! its come out so perfect..
My eyes lit up especially when I got to the YIELD: 24 saucer-sized cookies!! Heaven!! Blessings to you this day, Mary! I loved theso cookies, I have lots of lemos hera at home, i'll be doing them probably today. Bigger cookies always taste better. I can postpone my diet a day or two longer. And I do like cookies that can be made up one day and baked the next. I hope you have a day as bright as your cookies! I'll definitely be making these in the next week--I love huge cookies as well and have enjoyed them ever since I was allowed to have one a few times a month when we went on trips to the grocery store. One of the few store-bought cookies I could have! I can't wait to make these. WOW..I Love these giant lemon cookies..lemon is one of my favorite flavor to use in baking and cooking..thanks for sharing the recipe.. It must be full of lemon aroma! Sound so good. You had me at "giant"!! I had never heard that about WWII rationing. Interesting. My mom sent me a Confederate Army cookbook. Now, THAT was rationing. Coffee made out of roasted okra or acorns. Mock apple pies with lemon rind, tantaric acid (whatever that is) and whatever spices they could get their hands on. Cheers! I love lemon sugar cookies! They are right behind my favorite chocolate chip cookies! These look so lovely, Mary. I need to make a batch of these this weekend!! Thanks so much for sharing...and I love the story about your youth! My little one loves lemon, and even more so he loves cookies. What a special treat this would be for him! They look fantastic! I'm really enjoying your lemon week, looking forward to more! Love these cookies Mary. They look delicious and easy to make. I love just about anything lemon! I'm using it more and more, in fact I've started keeping a pitcher of lemon water in the fridge! I'm going to have to make these! Thank you for the background information about the bakers during the war, I had never heard that. It's always nice to learn something about cooking. If you have some time, please come by for dessert, it's sinful! Have a lovely day! They look fabulous and will be a perfect solution to all the lemons I still have hanging out in the refrigerator. I read the sad story mary, thank god now everything is different.. I Love lemon cookies Mary, DELICIOUS AND GORGEOUS thank you for the recipe. Love your bakery childhood story and these lemon cookies look divine! Have you been feeling left out recently... I haven't made anything from your blog for a long time.. this is on my list this week... excellent as always! What an interesting story- maybe bakers were exempt fromt eh draft to improve morale with their delicious treats? Your cookies look divine! I love the addition of lemon. Great idea! Oh wow!! These cookies look amazing. I made lemon sugar cookies a while ago, but your recipe seems to yield cookies with a stronger lemon taste, which I like!! Thanks! These look wonderful. They wouldn't last long with Cindy and me. Thank you! You're certainly on a lemon kick! Got anything for us orange lovers? Love your lemon cookies. I can only imagine how delicious they taste. Great photo also. Hope you're having a wonderful day, Mary! Love the story and the cookies look great! those cute little mom and pop bakeries are way too few and far between these days. I love these giant cookies. Especially your lemon infusion! Beautiful perfect cookies! Delicious + gorgeous. I just finished making a big batch of these. They are fantastic ! the dough is very easy to work with, they spread out perfectly during baking. Delish ! My son is a lemon lover, even his favotite color is yellow! Love the way you did the lemon sugar which may also have other uses, right? Maybe to sweeten a cup of tea! Bookmarked!!!!! Thank you for sharing your childhood story and this wonderful recipe!!! Your posts are simply the best Mary! You have so much knowledge to share and these cookies look just perfect! I love lemon in just about anything, I cannot wait to make these! OMG, Mary! I grew up loving lemon flavored anything and sugar is my next favorite food group! Just wish I could reach out and grab one to go! These are just perfect and I know I would that tart sweet taste with my cup of tea.Love anything with lemon. These look beautiful Mary. How nice these would be with a cup of Lady Grey. I love giant cookies and I love lemon. These are beautiful, Mary. With food so plentiful now, it's hard to imagine just what a special treat a cake would have been. Your lemon cookies sound amazing and look lovely too. I actually justs baked some sugar cookies this week. This sounds like such a fun twist! I'll have to stock up on my lemon items and try this out soon. i just adore anything with lemon in them, these are so bright and cheery, they remind me of spring! Hi Mary - thanks for allowing me to repost your recipe on my blog. I have just uploaded it plus pics. And yes, our family of 6 are in LOVE with them ! I love anything lemon so these cookies look perfect to me. Love the story. Interesting that bakers weren't subject to rationing. Our family LOVES anything lemon and I will have to put them on the top of my to-do baking list. I love a giant cookie and I love lemon a lot... I might bake these! Have a nice evening! Tis the season to have citrus integrated into desserts. These look so bright and sunshine-y and purely delightful! These cookies look so cute all stacked up! another great lemon idea - i love it! 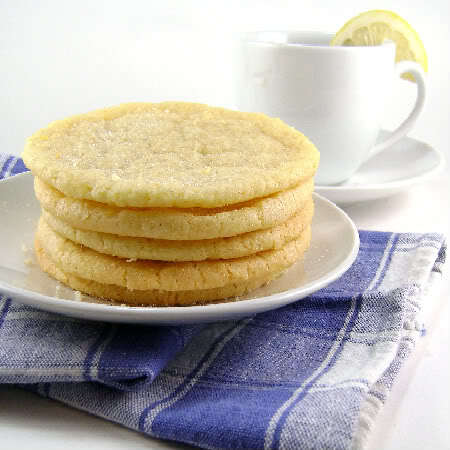 I love the lemon in it - most bakery sugar cookies seem to disappoint - yours look like the quintessential, beckoning cookie. Love the size of them! Not that's a cookie lover! I love these cookies and all the lemon treats you have been baking. I must try my hand at making giant size cookies. Love these giant lemon sugar cookies and the memories that come with it too! My grandma used to own the only variety store in our village and she always gives me the biggest cookies. I guess I never forgot that 'cause I somehow tend to bake bigger cookies all the time! We're in Lemon Heaven here by the ponds this week, with all the lovely lemony recipes! I've never seen or heard of lemon sugar cookies, but what a brilliant idea. I must try these. Loving your lemon fusion ~ What a lovely story. These look perfect! I love the idea of a lemon sugar cookie. Yummy, a giant warm Lemon Sugar Cookie and a cup of tea would be so good. I love the cookies, and very much appreciate (and relate to) your story, even if I didn't grow up during war rations. That's a fascinating story, Mary. I love giant cookies, they're just fun! These look scrumptious! Yum! These look fantastic. I enjoyed learning a little about war rationing as well. My mouth is literally watering looking at those cookies and reading the recipe. I can almost taste the lemony goodness! Bakeries are a magical place for children, no doubt. I loved your story. These giant lemon cookies would be very dangerous for me to have around. I can see them being a real favorite. Your photo is so stunning, I can see the sugar crystals glistening. Wow. I did not know about bakers being exempt from the draft. A practical decision. Mary, I'm going to have to take a sabbatical from your blog....lemon is my weakness! You are posting too many lemony treats! Your giant lemon cookies are like sunshine! I just love the tartness lemon gives to baked goods along with the sweetness. These are wonderful treats! Oh, I wonder if I can persuade the bakeries downunder that giving a free treat is a necessary part of their business?!?!?! What great memories...and what beautiful cookies. Don't you just love the brightness that lemon adds to simple baked goods? Thanks for sharing, sweet woman. Many blessing to you as the week unfolds. Gorgeous! I love lemon with sugar cookies. These look perfect, Mary. I just love a good citrus sugar cookie. Those look so great!!!! Bookmarked! What a great story, I'm glad I stopped by your blog and got to read it. Not to mention how delectable those cookies look! Have you tried these with different extracts? Almond might be tasty! What an amazing blog you have here! I'm so glad I found you. We have a Meyer lemon tree, so all your lemon recipes will keep me mighty busy. Thank you! I made these a few days ago. Absolutely wonderful!! I baked another of your sugar cookie recipes ... and can't wait to try this one, too. Can you roll out the dough and cut out shapes with ghis cookie dough? You could try to roll well-chilled dough but I think you'll quickly become frustrated. This is a soft dough and not designed to roll and cut.